The ‘about’ page for the original ENDABlog focused on the context of that blog’s creation. That, of course, was Barney Frank’s betrayal of showing what he really thinks of trans people back in 2007 by relying on a likely non-existent whip count of House members to justify pulling that year’s H.R. 2015 – a legitimate (read: trans-inclusive) ENDA – in favor of the type of ENDA that we all know that he really wants: one that has no taint of icky trans-anything. There was one other key aspect of the 2007 betrayal: George W. Bush still occupied the White House and was being allowed to exercise the powers of the presidency – meaning that no ENDA would have become law even if it had passed both houses of Congress. But the Barney-HRC betrayal of 2007 only bought Gay, Inc. a slim victory in the House for their sanitized, illegitimate ENDA. Well, it also bought undying distrust of the Cesspool, St. Barney and their apologists by all trans people – excepting a small group of quislings and tokens who can afford not to have to worry about whether a trans-inclusive ENDA happens because they either have guaranteed employment or, in the immediate aftermath of the 2007 debacle, were magically blessed with appearances-only jobs designed to con trans people into believing that the Cesspool, St. Barney and their apologists actualy give a damn about whether trans people as a group live or die. The 2007-08 session of Congress gave way to the 2009-10 session – which was not hampered by a Republican (alleged) president, but was nevertheless hampered by gay wants (read: DADT repeal.) After the 2007 debacle, St. Barney claimed that with 15-20 more Democrats in the House, a trans-inclusive ENDA would be do-able – and, interestingly, that’s about how many more Dems came in via the 2008 election. We all know what happened with the 2010 elections. 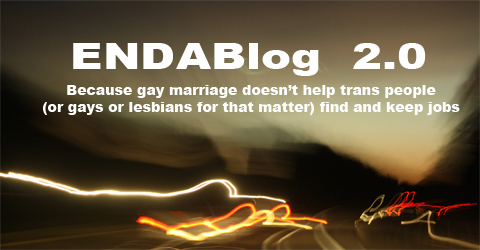 An ultimate legal landscape of the Title VII administrative ruling and a gay-only ENDA would be much like a gay-only ENDA by itself: trans people would be under the bus – only with a slight variation on the theme. Instead of the bus rolling over us and leaving tire tracks, we actually would be left standing – but underneath a Bus of Damocles, waiting for the rope to be cut in the form of any future majority of EEOC commissioners and/or Supreme Court justices who decide to undo what the current EEOC did. and that’s in addition to the separate-and-unequal state of affairs that would result in ‘know your rights’ posters blaring to all prospective employers that its illegal to refuse to employ LGBs but saying nothing about that Title VII ruling. …because we all know how easy it is to prevail in a failure-to-hire suit, eh? A trans-centered ‘Title VII ruling is all that trans people need’ mentality emanates from the same ski chalet of insanity that has generated trans support for public accommodations-free trans rights bills – whose legal regime, in practice, will be no different than no rights law at all. The only real rule here? I’m wondering whether it’s possible to sue you for any incremental brain damage I suffer if I actually read the articles you link? Like, isn’t that something like contributory, oh hell, something or other? … but I suppose that would be an imposture on my part, considering the rather sad State of The Noggin here after the umpteen 99 & 44/100% INSANE posts I’ve read on “Those Other Blogs”. — … “you know who you are” … but not really. Whatever: I’m very happy to see your blog reincarnated as ENDABlog 2.0… even though I’m going to miss feeding the trolls. But hey, I’m pretty sure Vicky can find “Some Other Blogs” that fancy his droll style of commentary? But maybe they only need one. ? Could it be that the fabled Substance-D has hit the streets, at last? PS: Even though I’m still basically a libertarian, and distrust the statist trend inherent in such anti-discrimination legislation, I tend to agree that legislative action on inclusive ENDA is required… without that, the existing statutes have the invidious effect of creating “protected classes”… and all without its boundaries are correspondingly marked “outcaste”, and fair game. I’m reminded of President Truman drawing the line around the “Protected Zone of Liberty”… and leaving out South Korea. Class act! Then complains about decorum. She’s reincarnated as Ruth H. Soria at transadvocate. Funny – this need to identify with something other than the boring, entitled, corporatist wasp she is. She’s really a secret punk, an Italian dude and now a Latina. I blame society for leading her to this sorry end.